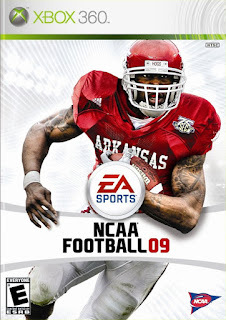 Well, I played the NCAA Football 09 demo today, as many of you probably already have. But for those of you who haven't played it yet, here's my review. In the main menu, you have the option of a quick play now game, a mascot game, a list of the online features, online dynasty features, Campus Legend, The Shrine, and a few others. Once you go to the Play Now, you have the option of Ohio State University or Louisiana State University. For my game, I chose OSU. Once the game starts, you are overwhelmed by the realistic feeling of the realistic massive size of the stadium, along with brilliant lighting effects in the stadium, especially noticeable in the stands. Here are my good and bad points I noticed while in the game itself. Don't worry, there are plenty more good than bad in this game! The Sidelines: Excellent work and including many more photographers, camera men, sound people, cheerleaders and realistic players on the sidelines along with coaches. Very noticeable as it really adds more realism to the game. The Animations: Many many more animations this year. Just from my two games with the two minute quarters, I saw several different tackling, catching, and post play animations during the game. I even saw an animation where the CPU player tried to tip the ball up to himself and juggle it in a way, and then my player ran over and tackled him before he got control of the ball. The players automatically begin to jog back to their huddle, and on special teams they jog back to the sidelines. Even after the play is over, different animations were seen while the players were sitting on the ground. I don't think I saw the same tackle twice in the same game, which is very impressive. Many more sideline catches were seen, which was great. The most talked about feature this year though would have to be changing from a juke to a spin or whatever without waiting for the animation to complete itself while your running. Running felt more realistic than ever before. While I never got to return a field goal that landed short of the goalposts, the fact that it was in the game is great. Post-touchdown celebrations were also very fun. Now after you score a Touchdown, you can still control your player. Just run around in circles if the mood so strikes you, or run to the mascot. There are several different options to choose from post-TD. Next time I score, I'm going to run over to the cheerleaders and see what happens. The Blocking: The blocking this year seems a lot better than last years. The main part of the blocking that I absolutely love is the ability to change the blocking scheme pre-snap. Before you hike the ball, simply press the Left Trigger and use the left stick in different directions to guide your blockers. Just set it, and forget it! Awareness: The players this year seem just at the perfect sensitivity of awareness while on the field. The linebackers don't jump all over the place trying to get the ball, they play like real players. After a ball has been tipped, you see players diving and trying to catch the ball this year, instead of just letting it harmlessly drop to the turf in front of them, which became so frustrating last year. There are no bad points so far, sorry. I found the demo very fun. I'll edit this if I find something I don't like. Second I just got finished with my first game on the demo. Have a few negatives I would like to share. I noticed when I would try and view the play I selected sometimes the player icons would be question marks and the routes would be badly distorted, almost wavy. Also IMO the graphics aren't much of an improvement from last years game. Other than that I really enjoyed the demo. Still undecided on if I will pick this up or not. Player models are said to be better than last years and 3d grass was added to the game. The game looked great last year, these minor changes should make the graphics better. This comment is for jrc865. First, thanks for the compliment of the write-up. I'm glad you read it. The reason the routes apear squigly and the icons above the player's heads have question marks is because of the home field advantage against you. If you are LSU, then this will happen to you because OSU has the home field advantage, and it's supposed to feel like you are being disrupted and stuff.